This card cannot be Special Summoned. When this card is Normal Summoned while you control no cards, draw 1 card and reveal it. If the card you drew is not a Monster Card, send it to the Graveyard and destroy this card. This card's Japanese name refers to Akiza Izinski, since she is known as the Black Rose Witch in the Japanese version of the anime. 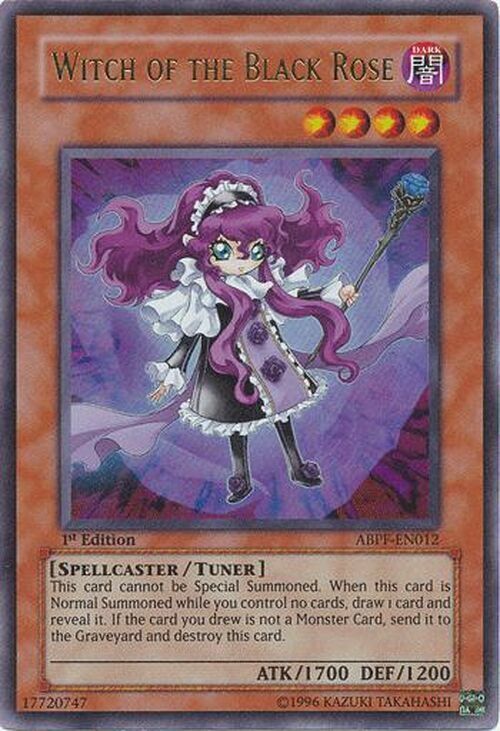 This card's English name may be a reference to Witch of the Black Forest. This card also shows up as the loading screen on Yu-Gi-Oh! 5D's Tag Force 5. If you have no cards in your Deck when you activate the effect of “Witch of the Black Rose,” you will lose the Duel. If you activate the effect of “Witch of the Black Rose” while you have no cards in your hand and you draw “Infernity Archfiend,” you can activate the effect of “Infernity Archfiend." -Draw 1 card. If it is a monster, the effect is over. If you draw a Monster Card, the last thing to happen when this effect resolves is drawing 1 card.